I love this shirt. I think the blues in it are very nice. Besides being particularly fetching, this blue plaid is Sam’s standard – western style, with snaps, and the plaid running diagonal on the breast pockets and shoulders. It’s a medium plaid in varying blues and white. In All Dogs Go To Heaven (6x08), this might be the shirt that Sam wears while he and Dean follow Cal around on his drinking binge. In Let It Bleed (6x21), Sam wears this shirt when Dean is busy torturing demons, and Sam tries to pray to Castiel. In Repo Man (7x15), Sam is wearing this shirt when he and Dean jump Jeffrey in the alley. He keeps it on until the end of the episode. In Of Grave Importance (7x19), Sam MIGHT be wearing this shirt at the beginning of the episode while he and Dean have a snack on the hood of the car they are using. That is a nice shirt and totally Sam's style. It's interesting how so many of the shirts they wore in S6 haven't been seen since. I wish we would see some of them. I wonder why that is. I just bought one that is similar...probably is a little lighter (more white and less blue) but close! Cool! 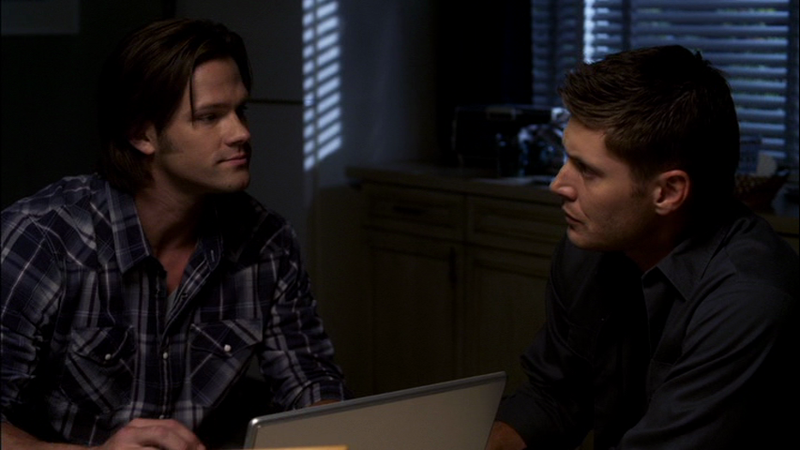 A good thing to remember when trying to find SPN clothes is that the wardrobe department often dies their shirts. So, for instance, I'm wearing a gorgeous purple plaid shirt from the SPN wardrobe department at the moment (not one worn by the boys, but still from the show, and bought at a wardrobe sale they had two years ago.) BUT, if I actually read the tag on this shirt, it informs me that the shirt was originally brown. I'm not sure if it's the case with this shirt, but it's something to keep in mind if you're hunting for the clothes. Good point. I'm sure they make them "fit" the guys - both color-wise and measurement wise. How do you find out when they are having a wardrobe sale? I just started watching this past year so I know I wouldn't have known about the one two years ago, but would love to find out about future wardrobe sell-offs (although, just heard they were renewed for S11 so they may not be selling any time soon!). Yeah, usually there are only wardrobe/set sales when a show stops filming - but they had one after S8, I suppose just because after 8 years they had built up too much stock and needed to clear out some storage space (there wasn't much primary wardrobe there, because they're still using it, of course). So, yeah, I unfortunately can't give any advice besides "try to make friends with someone who is in the industry and hears about these sales and can pass on the info to you." Because that's what I did.